Kitman TV: Geert Wilders: Europe's Most Dangerous Man? 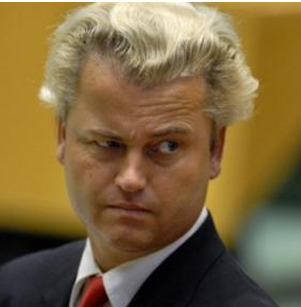 geert wilders, holland, jihadfilm » Geert Wilders: Europe's Most Dangerous Man? "He was once refused entry to Britain. He has called for the Qur'an to be banned and has proposed a tax on wearing headscarves. And he is also the first politician ever to stand trial on charges of 'incitement to hatred'. Geert Wilders, instantly recognisable for his quiff of platinum blond hair, is one of Holland's most controversial and well-known politicians and, some argue, Europe's most dangerous man. Bafta-winning filmmakers Mags Gavan and Joost van der Valk follow Wilders on his campaign trail during the recent Dutch elections, meet members of the international anti-Islamic network who support him, and find out about a conspiracy theory promoting the belief that Europe is being taken over by Islam. With anti-Islamic, anti-immigration parties on the rise all over the European continent, why has Wilders, on the brink of real power in the Netherlands, become the poster boy for the far right?"